Eddo Hoekstra suffered a paralyzing stroke in June, 2012. 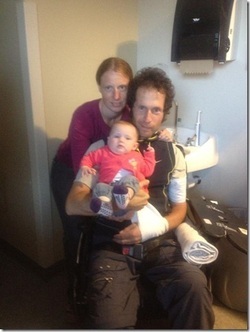 Just a few weeks before the stroke, Eddo also became a father for the first time, making his stroke even more tragic. His teaching, riding and training are his sole means of support and he is now completely wheelchair-bound and paralyzed on his left side. Eddo is engaged in extensive rehabilitation efforts at this time, but his prognosis is as yet unknown. To date, he has begun being assisted to stand on his feet a bit, but cannot as yet walk more than a step of two - and that with the help of two therapists - and currently has no use of his left arm. Fortunately, his speech as not been too seriously impaired and he would love to begin teaching lessons at his stable from a wheelchair and using a headset microphone system. However, the only wheelchair he has is a small, push type and it is completely unsuitable to the uneven terrain of a horse farm and arena. He needs an all-terrain motorized wheelchair – but they cost between $10,000 and $15,000. And, of course, he has household and medical expenses that are mounting very quickly. Sonesta Farms are planning a two-day series of events to help raise money for Eddo. The first day - Saturday October 27, 2012 - they will hold a general benefit on their farm open to the public. This ticketed event will have a barbeque buffet, two live bands, swimming, hot tubbing, pony rides, Halloween costume for kids, face painting, horseshoe pitching contest, a puppy kissing & cuddling booth, and more. They will also have a silent auction and will sell custom designed T-shirts with a horse graphic and one of Eddo’s best known quotes: “Control less. Create more.” On Sunday - October 28, 2012 - Sonesta Farm's resident trainer, USDF Silver Medalist and British Horse Society Level II trainer, Andrea Seaman, will hold a clinic with all proceeds to go to Eddo. The clinic will cost $100 per ride and will include a day/night stall at Sonesta Farms, a video of the ride, a seminar on how to braid your own horse for the show ring, a nice lunch and a cocktail party afterwards during which they will phone Eddo and put him on speaker so everyone can visit with him. Sonesta Farm is trying to go much broader in their efforts and sell the T-Shirts online as well as seek direct donations for Eddo. This latter is where we at LEAP are trying to help out. Leg-Up has earmarked a percentage of the funds from the foal raffle this year to be dedicated to assisting with the purchase of the mobile wheelchair for Eddo. Additionally, we set up an account that will allow us to accept donations that will be specifically dedicated for that wheelchair which will offer donors the ability to write off their donations on their taxes as a charitable donation .